Garrison Keillor's performance Tuesday in New Jersey was extra memorable for at least one audience member -- and not only because it might end up being the humorist's last public appearance for a while. 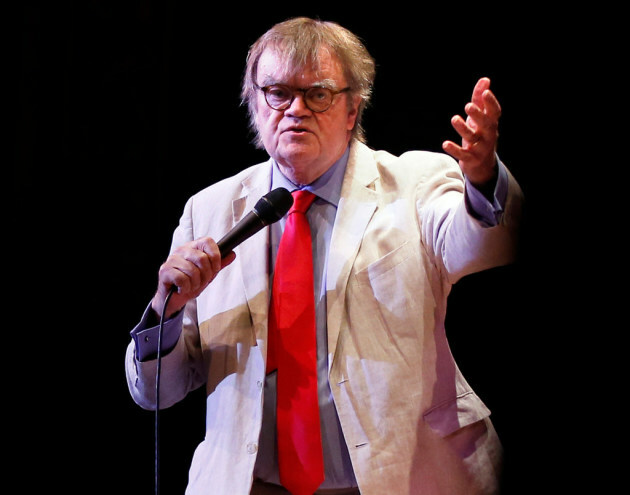 Keillor was in the midst of his "Prairie Home Love & Comedy Tour" earlier this week when he was dropped by Minnesota Public Radio after allegations of inappropriate behavior with a co-worker. On the eve of the announcement, Keillor performed at the South Orange Performing Arts Center, about a 40-minute train ride from New York City, where he offered up a mix of sing-alongs, limericks and musical numbers from Robin and Linda Williams. There was also a defense of Al Franken that borrowed heavily from his syndicated column that was published earlier in the day. But what spectator Charlie Paikert remembers most is a monologue about Keillor’s first date in high school. Paikert, a senior editor at Financial Planning magazine, said the story included a moment in which a teenage Keillor is twirling on the dance floor with his prom date, describing a dress that was high in the front and very low in back. “There was one vivid detail in which he was putting his hand on her bare back that he said somehow felt ‘wrong,’” said Paikert, who sat in the orchestra section with his wife and friends. One of those friends, David Crow, recalled that Keillor included a line that while he and his date danced, “My hand went as low as you can get on the back of a dress.” The anecdote led to the couple driving to a deserted cemetery and stripping naked in the car. Keillor was scheduled to perform every night from Wednesday through Sunday in Connecticut and New York, but all five shows have been canceled. His next scheduled performance is Feb. 5 near St. Petersburg, Florida. MPR and Keillor did not offer any new comments or updates Thursday.